The Alliance Party has condemned an election leaflet that claimed its Belfast councillors had a record of "voting with the Provisional IRA's political wing". The leaflet was issued by Ulster Unionist Party (UUP) council candidates Peter Johnston and Jim Rodgers. It said Alliance councillors on Belfast City Council were "closely aligned to Sinn Féin". The UUP said it was "not a central UUP message". Mr Johnston and Mr Rodgers are standing for election to Belfast City Council in the Ormiston ward. 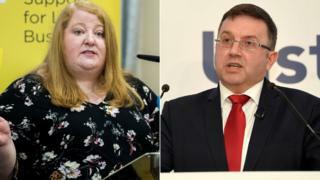 Alliance leader Naomi Long said: "This is a deliberate attempt by the UUP to link Alliance members to the IRA, in an area where our offices have been attacked, representatives have received death threats and some have been forced to leave their homes due to previous raising of tensions by the UUP and others. "While I wish I could say I was surprised by their latest actions, given the UUP's involvement in producing 40,000 inflammatory leaflets several years ago, I sadly am not." Speaking on the BBC's Evening Extra programme, the Alliance leader called for the leaflet to be withdrawn and for an apology to be issued to its councillors who sit on Belfast City Council. "Alliance, throughout it's history, has been unequivocal when it came to violence and upholding the rule of law, and therefore of course it offends me," she said. "But I think also, potentially, places our councillors and our workers in danger when people try to falsely align us with any paramilitary organisation." She added that there was no need to "smear" rival candidates in order to get elected. BBC News NI has seen correspondence from Mrs Long to UUP leader Robin Swann, sent on Friday, where she asked for "assistance in getting this nonsense stopped". She said the leaflet was not factually correct and that language of that type could "enable" threats from members of the public. It is understood Mr Swann contacted Mrs Long in relation to her concerns on Wednesday. A UUP spokesperson said the matter had been referred to party officers. They said: "This was not a central Ulster Unionist Party message. It is included in a leaflet distributed in the Ormiston District Electoral Area (DEA). "Naomi Long advised Robin Swann that she had also referred the leaflet to the Local Government Ombudsman." On Twitter, the UUP MLA Doug Beattie said the message in the leaflet was "not my view". This is not my view Richard..... however as someone who hates DUP policies and practices to be continually called DUP-lite by Alliance & others is just as bad. But for some reason acceptable?